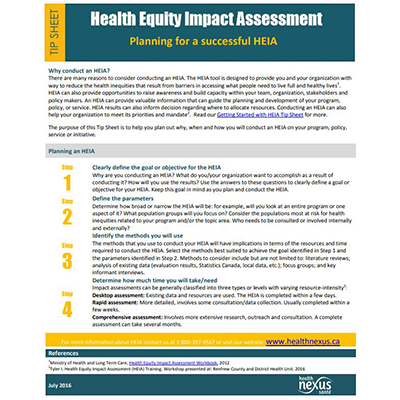 The HEIA tool is designed to provide you and your organization with way to reduce the health inequities that result from barriers in accessing what people need to live full and healthy lives. There are many reasons to consider conducting an HEIA. HEIA can also provide opportunities to raise awareness and build capacity within your team, organization, stakeholders and policy makers. An HEIA can provide valuable information that can guide the planning and development of your program, policy, or service. HEIA results can also inform decision regarding where to allocate resources. Conducting an HEIA can also help your organization to meet its priorities and mandate. The purpose of this Tip Sheet is to help you plan out why, when and how you will conduct an HEIA on your program, policy, service or initiative.